Vienna, the city that never woke up. Pearl of the Balkans. The biggest trash can of Eastern Europe. Mock it, as you wish - it is and remains a significant city and proves highly popular among tourists. Vienna is - as I am confident you have found out already - the capital of Austria, but also the biggest city of the nation (with a population of 1.7 millions) and due to its past as a capital of a vast empire, it is packed with sightseeing attractions, things to do and places to go to. All that makes Vienna a "European grade A capital" that I would rank among the top 6 with Rome, London, Prague, Paris and Budapest in terms of general appeal. So what is there to see and do? Vienna is divided into 23 districts. The central first district "Innere Stadt" is the historic city centre, which is surrounded by Ringstraße, a 19th century boulevard with most representative buildings. The Ringstraße runs where the city walls were until their destruction - an inner circle that is echoed by an outer one, the Gürtel. From the first district, several major roads extend to the outskirts - for example, the Mariahilferstraße or the Wienzeile. The latter one connects the first district with the Palace of Schönbrunn. Vienna is framed by the hills of the Vienna Woods in the West and - at least the historic parts - by the Danube in the East. Other important landmarks are the Donaukanal and the Alte Donau, old Danube River beds. For a list of attractive look-outs, see my article on "Vienna from Above". A concise, but pretty cool intro to Vienna sightseeing, unfortunately with the usual sightseeing sterotypes. See also my "Complete List of Museums" in Vienna. See also my list of Vienna's Churches. 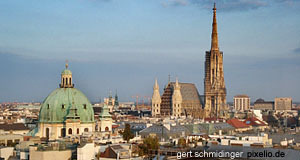 Note that many churches of Vienna (and there are many, many churches in Vienna) are a mix of styles due to alterations. This applies especially to very old ones. For the category, I chose the original or - if the church was strongly altered at some point in it history - the most significant current style. See also my list of Vienna's Palais and my introduction to the "Vienna Palais"
My guide to "other attractions" of Vienna is not finished. Please come back later. Another article in preparation: "Vienna Squares, Neighbourhoods & Themes"